In Medical Anthropology class this semester at WCSU, students are learning about healers a little different from those who graduate from US medical schools. In reading Anne Fadiman's classic story, The Spirit Catches You and You Fall Down, they learned about Lia Lee, a Hmong child with epilepsy, whose parents believed her illness made her special and who sought shamanic healing, disregarding most of the biomedical advice put forth by the staff of the hospital treating their daughter. Hmong shamans go into a trance state, contacting the spirit world to entice lost souls back to the sick. They sacrifice pigs, cows and chickens whose souls can be exchanged for those of humans. Lia's parents knew that Lia's errant soul had been frightened away when her sister slammed shut a door; they believed anti-convulsant medicines could not cure Lia, only the return of her soul. Today, having learned much from stories like Lia's, medical centers including UC Davis engage immigrant communities like the Hmong, working in complementary not hegemonic ways to both prevent and treat illness and disease. To bookend our examination of shamans vs. biomedical healing, I discussed Linda Miller Van Blerkom's article, "Clown Doctors: Shaman Healers of Western Medicine. This article reports on the Clown Care Unit (CCU), a group of professional clowns who visit pediatric hospital units as well as Paul Newman's Hole in the Wall Camp for children. Co-founder and creative director of the Big Apple Circus, Michael Christensen, founded CCU in 1986. The clowns work in teams of two or three, 'healing' not just their young 'patients,' but their parents and hospital staff as well. Currently, 80 committed and talented professional artists conduct clown rounds one to five days a week, year-round, making nearly 225,000 visits to young patients every year. Clown doctors are trained in specific hygienic practices and protocols and in special issues related to interacting with hospitalized children. Performers collaborate with doctors and staff to design a program that fits the needs of each hospital. They visit children in both inpatient and outpatient units, including intensive care, emergency room, physical therapy, bone marrow transplant, pediatric AIDS, and hematology/oncology. Now for the 'official story.' In her article, Van Berklom suggests that "clown doctors in New York may actually increase the effectiveness of biomedical care through the use of techniques similar to those recorded for clown healers and shamans in other cultures." Like shamans, clown doctors manipulate symbols and engage people in psychosocial ways that bring together - instead of separating - the mind and the body, the disease and the illness. Using puppets, ventriloquism, costumes and silly acts, 'Dr. Stubs,' 'Dr. Gizmo' and 'Dr. Meatloaf' make their patients laugh. They dismantle the mystique of hospital machines by making music with hospital tubing and hypodermic syringes, they climb over chairs, have water fights, sit in people's laps, overall managing to relive anxiety through 'magic.' While not claiming to cure any disease, the CCU enhance psychological and social well being, promoting the 'placebo effect.' As Van Berklom concludes, "Use of clowns in conjunction with other health care personnel can promote patient satisfaction and compliance, especially in children, which may contribute to more positive clinical outcomes." But, if anyone saw the 1998 movie Patch Adams starring Robin Williams you are already familiar with the challenges of this true life doctor to promote the healing power of laughter in the sober halls of a medical school. Today, Patch Adams and the Gesundheit Institute develop projects "in holistic medical care based on the belief that one cannot separate the health of the individual from the health of the family, the community, the world, and the health care system itself." Through humanitarian clown trips in the US and abroad, with clinics in poor Philadelphia communities and educational programs, including classes in 'clown philosophy,' Patch Adams shares his belief "that laughter, joy and creativity are an integral part of the healing process." Do check out their photo and video gallery. 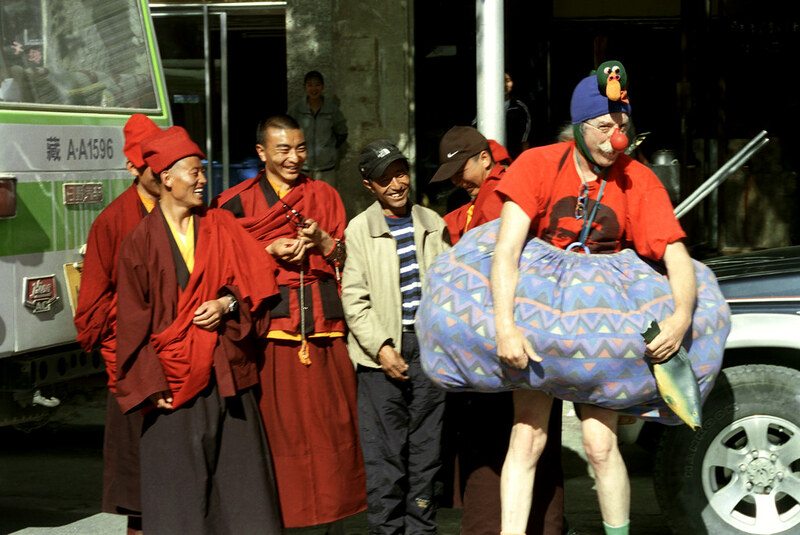 While looking through the photos of clown parades in Tibet and Belen, I was reminded of the healing effect of Palestinian Circus School which I wrote about recently. On that note, Al Jazeera just posted a video on Cirque Shems'y in Morocco, or the Circus of My Sun, a circus that helps the poor through performance, but in a different way than the circus school in Palestine. Each year hundreds of poor children and teenagers come to try out for a chance to change their futures. When the circus first began 10 years ago it was a social project for children on the streets and in the slums of Salé. As it grew, the talents of many of the young people involved came to the fore and in an international circus competition 10 out of the 12 prizes were won by young Moroccans from Cirque Shems'y. The organisers saw that the circus could actually become a professional career for some of the young people involved and set about transforming it from a social organisation to a professional circus school - offering an internationally recognised vocational diploma. If laughter has a healing effect, perhaps these young people will have at the very least a psychosocial boost towards a future with perhaps a bit more hope and a bit less despair in their situation. While the circus aims to eventually become self sustainable, they are currently funded by groups across Morocco and Europe and linked to Amesip, an NGO helping disadvantaged children. From shamans to clowns, from the rituals of bio-medicine to the entertaining routines of the circus, being happy seems a prerequisite to being healthy. So, let's tell some jokes and tickle some 'funny-bones,' then raise our glasses to "health and happiness."